Nov 14, 2018 / WORDS Anna Rose / PHOTOS Josh Coffman / Faster, heavier and punkier. Sum 41, Pennywise, Thy Art Is Murder, Polaris, Twelve Foot Ninja, Slaves and Voyager! As if the promise of seeing the likes of Ozzy Osbourne, Slayer (on their final world tours), Rise Against and The Amity Affliction on a bill together wasn’t enough, the addition of these seven bands to the line-up will surely reunite the heavy music community and fill a gaping hole in live music in what looks to be the event of the year! Other major highlights from the first line-up announcement include Judas Priest, Alice In Chains, Halestorm, Frenzal Rhomb, Luca Brasi and Alien Weaponry, to name just a few. 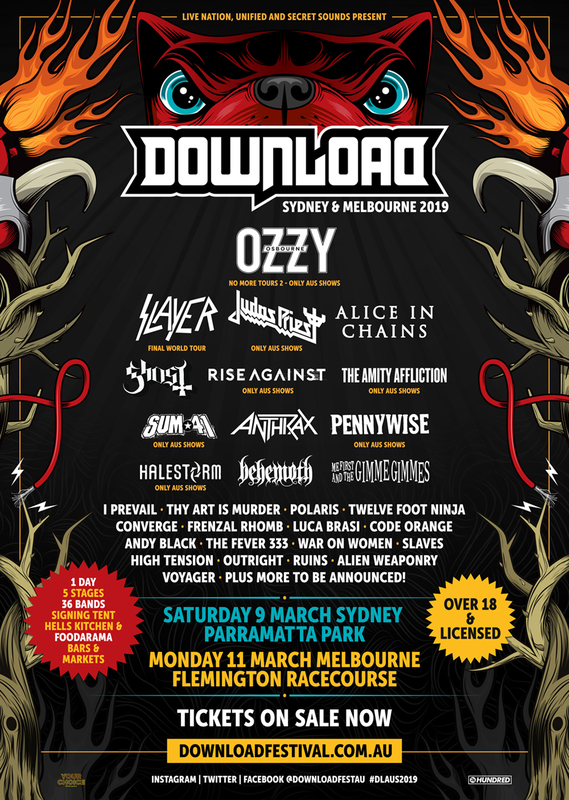 Download is set to rock Sydney for the first time in March 2019, taking over Parramatta Park, as well as returning to Melbourne’s Flemington Park after an exhilarating and sweaty debut earlier this year. Tickets are on sale now and available here. Scroll down for more info on the bands featured in this BANGING second announcement. Since the release of their 2001 debut All Killer, No Filler, which gave us skate-punk bangers like Fat Lip an In Too Deep, Sum 41 have continued to shape the punk-rock movement. After the release of 2016’s intense album 13 Voices, Sum 41 were met by a dedicated fan base who only kept crying for more! Now those Grammy-nominated Canadian ne’er-do-wells will hit up Download Australia with an abundance of nostalgic anthems and impassioned newbies. 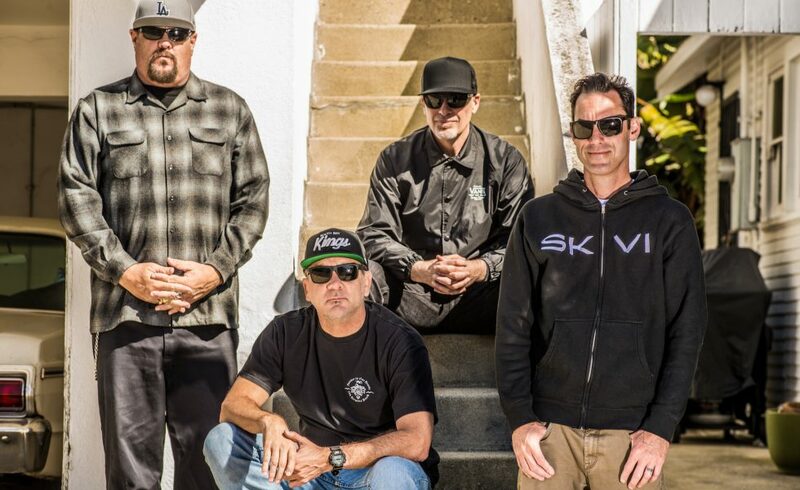 They reign supreme as the unchallenged masters of the non-mainstream, Pennywise are revered by fans of all generations after years of relentless hijinks and fast and furious times. Pennywise are the absolute soul of SoCal punk, whose shows are as much a lesson in life as they are a celebration. Yew! After the release of their incredible fourth album Dear Desolation, Thy Art Is Murder will play a massive home show like no other. The Sydney metal crew will perform on the changed face of their home town (and Melbourne) at Download with their globally renowned and relentless energy, merciless performance, and fervent metal melodies. You’ve got no excuse for not knowing Polaris, 2018 has been their year! Fast making their name as one of Australia’s greatest metalcore exports, the Sydney five-piece have made the rounds, touring with Parkway Drive, appearing for the second time at UNIFY The Gathering, and selling out all three of their national headline tours. After the release of their debut album The Mortal Coil, people were hooked and at Download you’ll see for yourselves why! Carrying the flag for the hard rock hitters, Twelve Foot Ninja have established quite the cult following. With an accolade of awards and recognition, more than a word count will allow, Twelve Foot Ninja’s fusion of experimental rock, prog-rock and all the other rocks in between make for a seemingly incomparable band and an invigorating live show. Getting their start on the UK pub scene, Slaves are high-energy punk like you’ve never before seen. Fresh off the shelf with their third album, Acts Of Fear And Love, Slaves are out to prove that big riffs, big beats, and big choruses, mean big fun! Another great representation of Aussie prog, Voyager are without a doubt the combo of technical intricacy and sublime chemistry Download festival needs – and here they are! The Perth piece have a firm reputation as “the band who doesn’t sound like anyone else” and for good reason. A Polaris performance, with their blended instrumental pop and progressive riffs, will have you completely enthralled.